In a previous post I asked my readers to post any questions they might have for Diane Fanning on her new book Mommy’s Little Girl and Diane has graciously answered all of our questions. How soon after the case broke were you approached to write the book? The day after Casey was arrested on the homicide charge, I received the phone call asking if I wanted to write the book. Was it a definite yes from you or did you have to think about it? Are you still making updates to the final script as we go along? As we go through the process of preparing the book for publication, I will make changes as pertinent new information arises. Do you expect to write a follow up and will you? I expect that after the trial—if there is a trial—the publisher might want me to write an updated version of the book. It all depends, I suppose, on how well the book sells. It won’t be my decision. Have you developed any kind of empathy with any of the people in this case? I feel empathy for some of the men in Casey’s life who seem like they were used and dangled for her convenience. And although George and Cindy make me absolutely nuts sometimes—and angry at others—I still can’t help but feel pity for them. I know from talking to victims’ family members that being the loved one of a murdered person is an extremely difficult situation. I also know from talking to perpetrators’ family members that it is hard on that side, too. And here are George and Cindy having to do both at one time. I’d like to think I wouldn’t behave the way they have, but I just don’t know and I hope I never learn. How did you choose the title for this book? I did not pick the title of the book, the publisher suggested it. I agree with their idea because I think that no matter how horrible a mother is, every little child loves mommy and everyone is mommy's little girl or boy. When will the book be released? 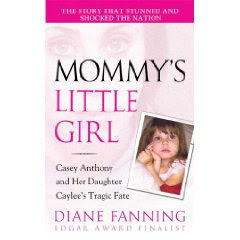 Did the Anthony family or anyone connected to them or Casey hire you to write this book? Who profits from the sale of this book? The book stores who sell it, the publisher who prints it and the woman who writes it, me. Where did you get the information that you used to write the story--interviews with family and friends, already released discovery, the media? I used the massive release of documents, etc. and interviews with people who knew Casey or the family. Why did you write the book now rather than wait until there was a trial and a verdict? When I agreed to write the book, the trial was set for January 2009. It was then moved to March 2009. By the time the trial was rescheduled for October, the publication train had already left the station. The same thing happened with my book about the Lisa Nowak case. My book was scheduled for release after her trial. It was published in 2007 and Nowak has still not had her trial. Will be a sequel to this book as the trial has not even started,and there are many, many things that have not been made public. Things like Dominic Casey's full interview that gives away defense secrets. I'm sure these kinds of things will come out in trial, but are not public. There is no guarantee that there will be a trial and, therefore, no assurance that all questions will be answered. Whether or not there will be a sequel is totally up to the publisher. Was it difficult for you to write this true story about the murder of a child? By that I mean,for instance, were you able to keep your feelings from showing in the pages of this book? I do not think that anyone can completely banish their feelings about the death of a child—particularly when the child is a homicide victim. Despite any beliefs of who did or didn’t kill a child, the loss of an innocent is objectively painful to all. Although law enforcement focused in on Casey early in the investigation, they did also pursue other people in Caylee’s life and tips that led them elsewhere. I am skeptical about a little bit of the evidence but the majority of it is solid and logical. Did you get an interview with any of the Anthonys? I attempted to get interviews with all of them but not one of them would speak to me. 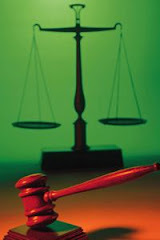 Do you have any idea why this case was more publicized than any other has been? There are a lot of elements that feed into the life of a news story. There is the serendipitous timing of the breaking news. If it occurred when a lot of other big news happened, it would be lost. This story also benefitted from a strange cast of characters, unexpected developments, and a long length of time until the body was found. I think, too, that most Americans view Orlando as a city built for children—the place they all want to go and play. For it to happen in this center for vacations with kids, added interest as well. It seems that there should be some kind of law against all the media attention this case got before the trial. Is there? I don’t think it would be wise to muzzle the media and prevent them from reporting on the stories they want to cover. Government restrictions against a free press leads down a path that could rob us of our freedoms and destroy our democracy. Was this book hard to write not knowing the outcome of the trial? Why do you think the Anthony case has gotten more media coverage and publicity than any other cases ever have? It has gotten more than most but not the most ever. The increased coverage is part of a trend brought on by the increase in crime shows like Nancy Grace and the proliferation of bloggers and internet radio. Isn't there some kind of law that should have prevented all this information from being broadcasted to the public? I meant there was just so much of it. It never seems to stop. It seems to be on tv every time one of them goes to the bathroom. If the television news reporters ever thought that we were no longer interested, it would diminish greatly. And no, there should not be laws stifling the freedom of speech of media.This is the cornerstone of the freedoms we enjoy in this country. Diane Fanning has published eight true crime books. A Poisoned Passion will be released on 1 September 2009. I cannot wait to read this book and Poisoned Passion.I have read all of Diane Fanning's published true crime books and I really enjoy her style of writing.Thank you so much Diane for taking the time out to answer our questions.I really appreciate it! There's a lot there now and I am eagerly awaiting the release of the book.. you have definately piqued my interest to learn more about this case.. Thank you E.H. it's just that there has been such hype about this book with a lot of people criticizing Diane that I thought my little blog could help out by providing answers.The major thing was most people thinking that Diane Fanning was writing the book for the Anthonys and at least that is all straightened out now.To re iterate-the Anthonys will NOT be receiving any money from the sale of Diane Fanning's book. I'm REALLY happy to hear there will be no monetary gain for anything Anthony-related, but it remains to be seen whether or not I'll buy the book. And the only reason I say that is because I can't see anyone knowing more about the case than some of the dedicated bloggers. That being said, it would be lovely to read through a factual and organized view of events. And maybe I'm wrong about the info, too. Maybe Fanning will have found out more than us by interviewing certain people. Is she still answering questions or have I missed the boat on that? If it's not too late I would like to hear her opinion or guess as to whether or not this will ever go to trial. Still won't buy the book. Blood money being sucked out of a babies death. There is nothing in this book that we all that have followed the case don't already know. Hey Starfish,then you probably shouldn't watch the news networks either because they are also operating off the same principle you mention above. I agree with Yvette. If this book found me, by that I mean not purchased, I might be somewhat inclined. However, all documents and discovery can be found online.